Home / health guide / WHY IT’S RECOMMENDED TO EAT ALKALINE FOODS? WHY IT’S RECOMMENDED TO EAT ALKALINE FOODS? 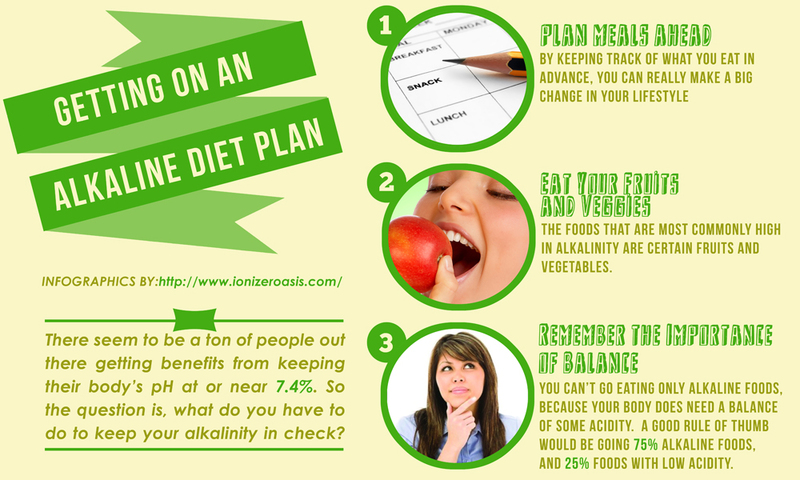 Alkaline Diet helps to maintain a constant blood pH. Body's pH levels is the key to life. pH is a measure of how acidic or alkaline something is & our blood pH needs to maintain a slightly alkaline to keep us healthy. We should help our bodies to maintain this P.H balance by eating more Alkaline -forming foods & fewer acid -forming foods. Your Blood is a slightly Alkaline, with a pH between 7.35- 7.45. Your stomach is very acidic, with a pH of 3.5 or below, so it can break down food and your urine changes, depending on what you eat; that's how your body keeps the level in your blood steady. 0-7 is ACIDIC. 7 is NEUTRAL. 7-14 is ALKALINE. The fact is... Foods simply cannot change your blood pH... However, food can definitely change the pH value of the urine. This is actually one of the main ways your body regulates blood pH by excreting acids in your urine. Our Kidneys are fundamentals to removing acids & regulating body pH. The kidney produces Bicarbonate ions that neutralize acids in the blood, a sustainable process which enables the body to tightly regulate blood pH. Our respiratory system is also involved in controlling blood pH. When bicarbonate ions from the kidneys bind in the blood, they form carbon dioxide (which we breathe out) & water (which we pee out). Alkaline-forming Foods: fruits, Vegetables, Herbs, seeds, Herbal teas. Acid-Forming Foods: Most grains, Beans, Non-vegetables, Dairy products, Fast foods, Processed foods. When we eat acid-forming foods, our body brings our Blood pH back into balance by releasing alkaline rich minerals such as calcium, phosphorus & Magnesium into our bloodstream. If we are eating enough alkaline- forming food each day, then our body has easy access to these minerals from our diet. If we are not eating enough Alkaline -forming foods, then our body has to pull these important minerals from our bones, teeth & organs. This can compromise our immune system, cause fatigue & make us vulnerable to virus & disease. Eat a diet of 60-80% alkaline forming foods & 20-40%acid forming foods. For the Acid -forming foods skip the fast food burgers & processed foods. Instead choose healthier options like beans, grains & other fresh foods. Also how the body reacts to certain foods is what determines what foods are alkaline-forming & what foods are acid forming. For e.g. Lemons are acidic in nature, but have an alkalizing effect on the body once they are digested. Milk also is alkaline outside the body, but acidic upon digestion. Baking Soda, Lemon, Onion, Pineapple, Lentils, Lotus roots, Pumpkin seeds, Raspberry, Sea salt, Sea vegetables, Spirilluna, Sweet potatoes, Vegetable juice. Apples, Apricots, Asparagus, Fresh beans, Broccoli, Carrots, Cashews, Chestnuts, , Citrus, Dandelion, Garlic, Fresh ginger, Grapefruits, Green leafy vegetables, Kiwi, Parsley, Peas ,Pepper, fresh corn Turnip. Almonds, Apple cider Vinegar, Apple, Avocado, Bell pepper, Cabbage, Cauliflower, Cherry, Egg yolk, Egg plant, Ginseng, Green Tea, Herbs, Papaya, Peach, Pear, Potato, Pumpkin, Radish, Sesame seeds, Sprouts.